Here is what our menu is going to look like when we are finished. Resize the screen to see what the responsive version looks like. Ability to upload files to your theme’s directory. Before we can start styling our menu, we need to first create the HTLM structure using the WordPress menu system. You probably already have a menu built in WordPress, but if you don’t head over to Appearance > Menus and create one. 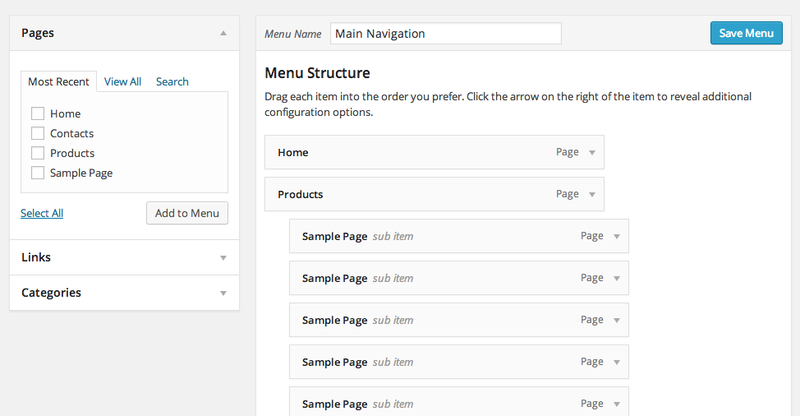 WordPress provides a easy to use interface to allows you to drag and drop menu items into a hierarchy. When you are done creating your menu structure, give the menu a name and then save it. Before adding our CSS and jQuery to the menu, we first need to make sure that the HTML being outputted for the menu is nice and clean. I’ve created a custom WordPress Walker Class that does just that. 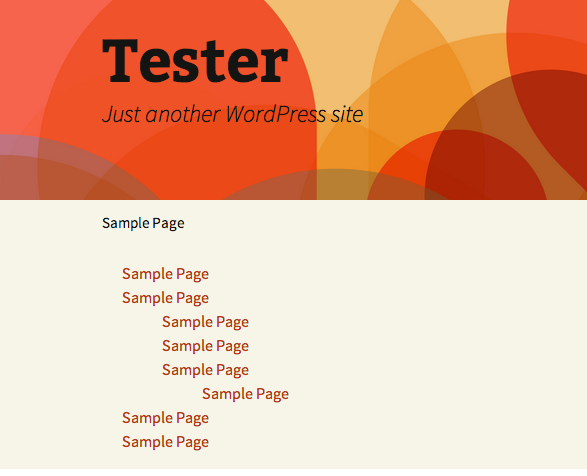 The WordPress Walker Class takes the structure of your menu and then prints out the corresponding HTML. The Walker class below makes sure we have nice, clean HTML to work with and that our menu items have the correct CSS classes assigned to them. To use this Walker class, simply copy and paste it to the bottom of your theme’s functions.php file. If you don’t see a functions.php file, then create one and paste the code in. Now we need to print out our menu using the wp_nav_menu() function. Where ever you place this next bit of code is where you menu will be printed out. I’m using one of the default themes so I’m printing my menu in the header.php file. This will be different for you though depending on where you want your menu to show up. Using PHP we will pass this function the parameters of our menu so that it can print out the HTML structure. 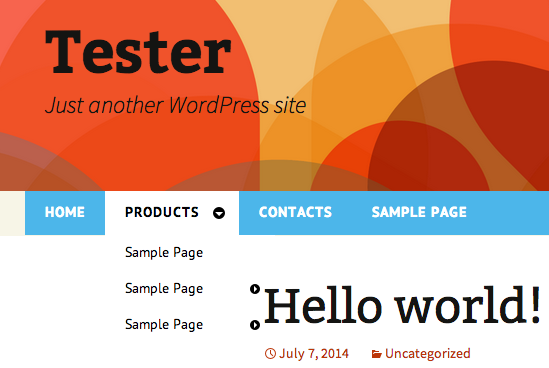 The ‘menu’ parameter is the name of the menu you created in WordPress. The ‘container_id’ will add an ID to the menu’s containing DIV. The ‘Walker’ parameter is telling the wp_nav_menu() function to use our custom WordPress walker class to print the HTML. Once you have placed this code in your theme’s template file, save the file and then refresh your site in the browsers. We have not added any styles or jQuery so you should see a plain HTML list being printed out like the one below. Now we need to add the CSS styles to our menu so open up your themes CSS file. It might be in a folder called css/styles.css or just a file in the root directory of the theme. I’ll break up the CSS to explain it a little bit, but you can also skip ahead and just copy and paste all the code in at one time. Notice that we are using CSS ID that we specified in the wp_nav_menu() function, #cssmenu. This first bit of CSS takes care of the browser resets so that everything is uniform. We are also using the free Google Font PT Sans that we are importing at the top of our file. This next chunk of CSS will take care of the majority of our menu’s styles. I wont go over it all in detail, feel free to ask questions in the comments about any part that you don’t understand. If everything has been done correctly, your should have a completely functioning drop down menu. If your menu doesn’t look like the image below, go back and double check your CSS styles. Now that we have your basic menu styles in place we need to create the CSS styles that will take effect for mobile devices. This is the responsive part of the tutorial. We will be using Media Queries to specify which styles kick in and at what screen width. We wont be able to see our responsive styles until we add a little bit of jQuery. So lets do that first before checking our menu. Next we will need to add the small amount of jQuery below to one of our themes script files. Almost all WordPress themes use jQuery these days so just find the file called script.js or possibly functions.js and paste the code in. Notice we are using the #cssmenu ID again to target our menu. That’s it! If everything was done correctly you should have a functioning WordPress responsive drop down menu. Great and a very useful blog for me. Thanks a lot for sharing the blog. but I do not have the menu icon (3 lines) but I have de icons arrows, where come these images (apparently no css) ? Thank you so much for this and for the corrections above. I am almost there I created a 3 line image, but not sure where to place in the css. I have a feeling I should place the image in the @media suggestions? My menu disappears when I go to mobile is this because I do not have an image? I am working on a localhost and the menu works great on full size, but it disappears when it goes to mobile. and I have also tried to (deleting the upper script) placed in the header.php file the script itself in between . I can’t get this menu to show up in the mobile size it just disappears. Can anyone help me with this? I really like this menu. Cheers, great walker class, I hate the output for wordpress menus, why they over complicate the hell out of it, only lord knows…. for those who have troubles with the missing “mobile” menu! Maybe you have to ajust the css for the “3-line-menu-button”. PS: Thanks for this tutorial!!! Got it working but the walker class is not working properly it’s not possible to set a menu for it, it seems to use whatever menu was created first regardless of what is set for it to use. 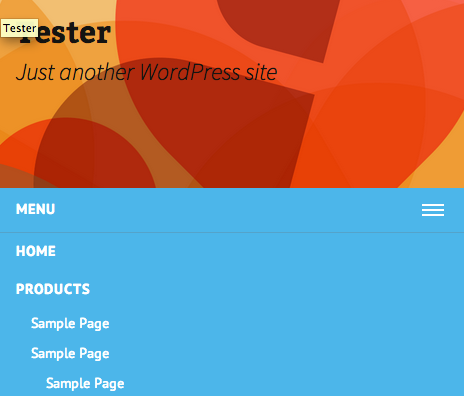 I’m use plugin WP-Mega Menu. took me 30 min to fix all this and I’m a beginner. Great article. Thank for your informative instructions. I have tried everything and the mobile menu just disappears every time the browser is resized! Someone please help! Appreciating the time and energy you put into this post and detailed information you offer. First great tutorial. I’m new to this and like the menu. I got the menu working. But still the mobile menu isn’t visible. I got a good working menu on the desktop but the mobile menu won’t show up. What I;m doing wrong ? Thank you. it will be great if we can add hard link directly and add left right navbar. thats good.glad for you . Hello there, I am just thinking about, who to write drop down menu code and got your tutorial. Thank you so much for giving us code. your tutorial are always very interesting . Thanx! The mobile menu button doesn’t show up on my site as well. Going to dig into this deeper to see what I can find out. Do I need an image somewhere? Thanks again for the awesome tut! Ok, I am not seeing anything in the CSS_Menu_Walker class that will add the #cssmenu #menu-button item that is ‘display:hidden’ in the main style but ‘display:block’ in the media query style. I’ve checked page source and inspected elements and nothing shows up for button at any window size. So I believe this is the reason. Of course this is the first time I’ve delved into the website menu at this level so I will post any other findings. Thanks t worked, I used in my wordpress website, now my menus are responsive, Great work., Sir..
I’d like to see the blue bar in the sample go to the end of the screen, to the right. The login address for accessing the administrative panel of your modem is 192.168.1.1 admin. As every single networking company uses software-loaded modems that facilitates the access of admin features online, altering the settings has become easy now. Thanks for this informative post that helps us a lot. I am surfing on a net and came across to your blog an find it very informative and entertaining. Thanks a lot for sharing such information with us. 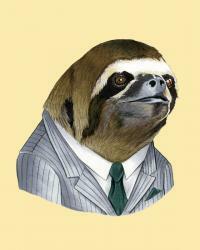 Hello sir how are you…?